1. Every contributor must be a subscriber member (Annual or Life member) of the Indian Academy of Environmental Sciences, Haridwar. 2. If there are upto three authors & co-authors of a paper then at least two must be subscriber /members. 3. If there are more than three co-authors (say up to six) then at least fifty percent of co-authors besides the first author must be members and subscribers to Academy / Journal . 4. Present rate of Annual membership is Rs. 1200/00 ( Rs. One thousand two hundred) only, per member. 5. The present life membership fee is Rs. 6000/00 (Rs. Six thousands) only for one member. 6. Life membership means for 12 years only. 7. The first author is given 20 reprints and a copy of journal (The author and coauthors may distribute reprints among themselves). 8. Only those members are given a copy of Journal each who are subscriber / member of the journal for the particular year. 9. Members who are not annual or life members are not given copy of Journal and reprints. 10. Reprints are sent Under Registered Post to the first author only. 11. For Coloured figures or photographs Rupees One thousand only (Rs.1000/00) per colour page are charged. No extra charges for black & white photographs. 12. All generic and species names of the plants and animals must be in italic in the text. 13. The Figures and pictures / photographs must be labeled with at least in 10 font size. 14. All the references cited in text of the papers must be included under the title of REFERENCES as shown in the example of format given here below. 15. Contributors are requested to follow the here under given format in the preparation of their papers. 16. Papers not received in proper format will be returned to the corresponding author for rectification. 17. For any linguistic error or errors in citing names of other researchers the corresponding author will be responsible. 18. For the originality of the contents of the papers the corresponding author will be responsible. 19. The papers are peer reviewed, and accepted for final publication only after revision ( if required ) and full payment of the dues. 20. Papers must be submitted via e –mail at : joshi_bd@rediffmail.com [To Prof. B. D. Joshi, Editor in Chief ] or at : jebsharidwar@gmail.com. 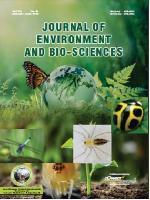 [ To Prof. P.C.Joshi, Managing Editor] along with a hard copy under registered post to : Prof. P.C.Joshi, Managing Editor, Department of Zoology & Environmental Sciences, Gurukula Kangri University, Haridwar, 249404, ( UK ) India.